Helping you return to your active lifestyle. 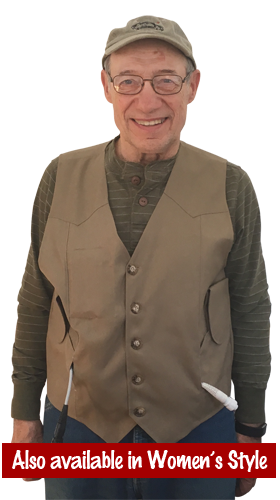 The Bosco LVAD Vest was designed to help my husband manage the external equipment that came with his Left Ventricular Assist Device (LVAD), the HeartMate II by Thoratec Corporation. The weskit style vest (Patent #D647,690) secures the controller and batteries with little strain on the shoulders. It is custom fit to be worn snugly so the nearly eight pounds of equipment has little room for movement. The vest keeps the equipment totally hands free and above the waist for easy bathroom use. The vest can be made for a variety of LVAD models including the HeartMate II, HeartMate II or III with the pocket controller, or HeartWare. Please see "Which Vest Do You Need?" to determine which vest you will need to order. Photos are available there also. Since our first vests were made, thousands of LVAD patients have enjoyed the freedom and comfort the vest offers. Let us help you, too! Which Vest Do You Need? Learn more about the types and options available.